Energy Efficient 1W LED Pull Lights! 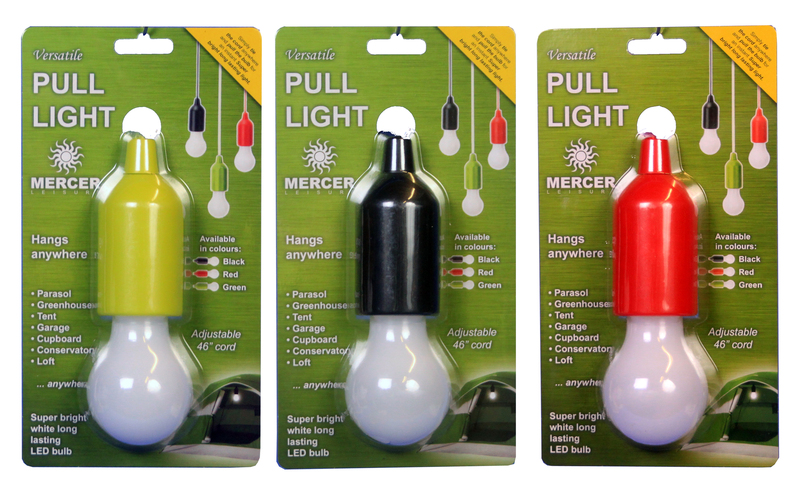 Our Battery operated LED Pull Light comes in 7 colours. Green, Black, Red, Wooden, Pink, Blue and Beech. They are operated by 3 x AAA batteries. Simply insert the batteries and pull the bulb. Instant Light! Our battery operated LED Pull Lights have been developed over the years to create an energy efficient, time saving and no hassle alternative to mains wired lighting. With its super bright white long lasting bulb (1W), you can be assured that the LED Pull Light will add light anywhere. In fact, our LED Pull Lights will hang anywhere with its adjustable 46" cord. Parasols, Greenhouses, Tents, Garages, Cupboards, Lofts... you name it, 'absolutely anywhere'.